The footpath down Hummersea steps cuts right through the remains associated with the Alum House for the Loftus Alum Quarries. The remains of the building are fast eroding out of the cliff and will likely be gone within a few years. The largest remaining stucture is thought to be a kiln for cementstone. 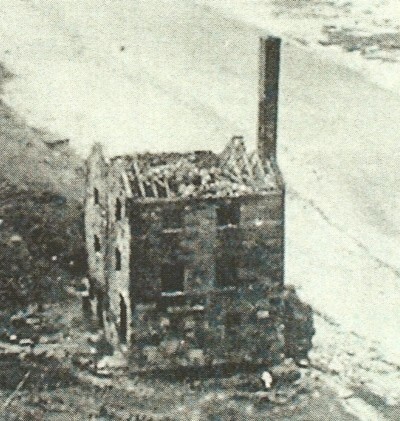 Nothing remains of the three story building with a large chimney which was photographed on the site around 1900, by 1910 it was a complete ruin with only a couple of small wall remnants left. This entry was posted in Alum, Industry by chris.twigg. Bookmark the permalink. And beware of these steps! This metal ladder is only fastened at the top and the bottom of the ladder ends a distance above the beach. It sways backwards and forwards making it difficult and dangerous to climb even once you have eventually managed to actually reach the first rung. The majority of the steps are covered with rusting loose chicken wire which can catch on your shoes. I had to scramble up and down this ladder to escape the tide on 1st October 2015 making two trips to rescue my two large dogs as we were cut off by the tide back to Skinningrove. I had no EE mobile phone signal on the beach or top of Hummersea Cliffs with which to seek assistance, and l understand from locals there is no reception on the beach for other mobile providers in that area. I had been told at the start of my walk that it was possible to reach Hummersea clifftops as there were steps from the beach up the cliffs.